Sighting in a bow isn’t hard, but it is easy to be a little confused and waste some time moving your sight pins in the wrong direction and generally fooling around. 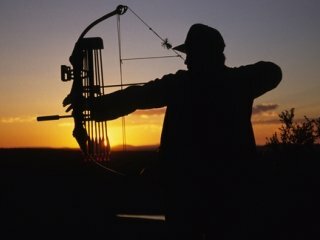 If you fool around much you will take several days to sight your bow as you can only shoot so much before fatigue plays a role, and then it’s over for the day. Here are the basics. Make very small adjustments to avoid overcorrecting. Start at the shortest range you will shoot and work your way out to more distant ranges. When adjusting your sight pins left and right, adjust your entire sight. Individual pins are aligned vertically and the left and right adjustment will be the same as long as your bow is held straight. If your bow is shooting to the right, follow the arrow by moving the sight block to the right. If you are hitting left, then follow the arrows by moving the sight block left. Move the individual sight pins to adjust elevation. If arrows are hitting low, move the pin down to raise the point of impact. If arrows hit high, raise the sight pin to lower the point of impact. Sight in at one distance at a time, and if you get tired, take a break or finish the next day. Modern bow sights take the guesswork and instinct out of aiming a bow. Use these simple guidelines to take any guesswork out of sighting it in.